Each frame is .1 seconds apart. Laure Manaudou's time for this 400-m freestyle event was 4:05.34. This analysis is presented to verify the actions of right arm propulsion, which was not exhibited clearly in the previous analysis from the left-side perspective. 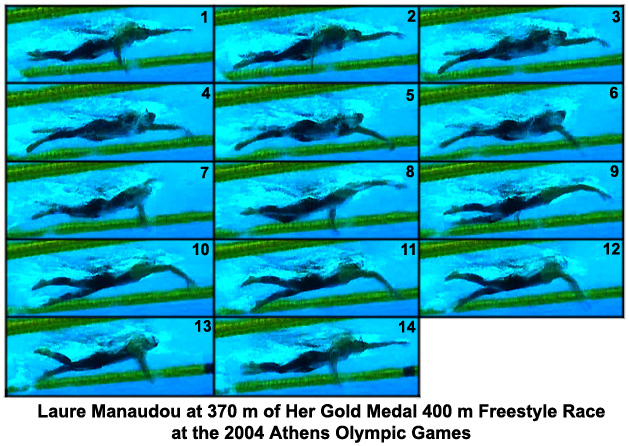 The main features of Ms Manaudou's stroke are similar to those of left-arm propulsion. The stroke has a very short lag between the end of propulsion of the left arm (Frame #10) and the beginning of propulsion of the right arm (also Frame #10). The consistent application of force will reduce the amount of slowing between alternating arm strokes. It is a highly desirable mechanical feature. A two-beat kick allows the arms to rate and act in a dominant manner. The arm action is not compromised by having to wait for the legs to complete six kicks. Not having to compromise the arms, leads to a high turnover rate. The role of the kick is not propulsive. It counterbalances the entries and to some extent the arm exits. It is also correctional; achieved by creating drag forces that support body rotation and assist in keeping the hips elevated in a streamlined position (particularly when the head is raised to breathe). After a very quick repositioning after entry, the whole arm develops propulsion in the abduction and adduction movement phases of the upper arm. The latter part of the stroke, where propulsion is provided by the lower arm and hand, is long and effective. That is a part of a stroke that is emphasized rarely by coaches, although one could make the case that it is the most important phase of propulsion for it develops the final release velocity of the arm's action. The effective propulsive phase of the right arm stroke is particularly long. The breathing action develops significant turbulence that would be detrimental to the swimmer's progress as well as causing unnecessary forces to be developed to support the extended breathing action. The swimmer's bodysuit increases surface drag, and is therefore detrimental to the swimmer's progress. There is no "anchoring" of either arm in the total stroke cycle.